The Association of Volleyball Professionals began on July 21, 1983, as a reaction by the top beach volleyball players to what they perceived as overly-greedy private tournament promoters. The first logo design was provided by Ken Jencks and Steve Fisher of the Manhattan Beach Recreation Department. One of the earliest tour sponsors was Miller Lite beer and play involved a double-elimination format, with select tournaments sponsored by Jose Cuervo tequila offering additional prize money and a unique format that narrowed the field to the top 8 teams, which then played in a round-robin to determine the top two teams for the championship match. Only men were allowed to compete on the tour until the women's tour, the Women's Professional Volleyball Association which had a separate sponsorship with Coors, ceased operations in the late 80's and a women's format was added to the AVP tour schedule. The winningest men's teams in the history of the tour include Jim Menges/Greg Lee (70's), Sinjin Smith/Randy Stoklos (80's), Karch Kiraly/Kent Steffes (90's), and Todd Rogers/Phil Dalhausser (00's). After the merger of the AVP and the WPVA/BVA, the top women's teams include Holly McPeak/Nancy Reno (80's) and then McPeak with Elaine Youngs (90's), Misty May/Kerri Walsh, and Elaine Youngs/Nicole Branaugh (00's), along with Rachel Wacholder-Scott and Jenn Kessy-Boss/April Ross. After experiencing a boom in interest in the 80's, the tour fell on hard financial times and filed for bankruptcy in the late 90's, still owing prize money to players, the most vocal of whom was Steffes who refused to play in any more professional tournaments unless the tour could actually show him the cash prize money. What's up with sponsors now? After Nissan terminated its relationship with the AVP, the main tournament sponsorship was picked up by Crocs footwear, who agreed to continue to use the bright yellow with black trim "corporate colors" that the AVP had agreed to use under Nissan's sponsorship. Due to market downturn, Crocs ended its sponsorship two seasons later. During the final year of play of the AVP, Nivea had signed as the title sponsor. 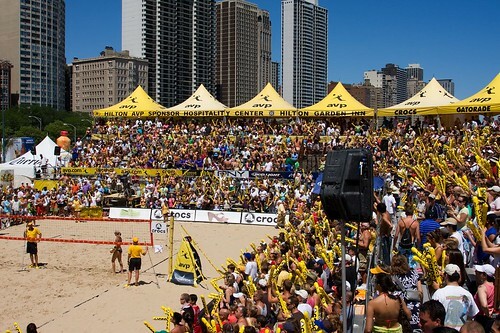 The 2010 AVP NIVEA Tour. In 2010 the AVP was scheduled to host 12 major events all over the United States but instead ceased operations in July, approximately half-way through the tour's 2010 calendar, and filed for chapter 11 bankruptcy protection at the end of October. The tour, up to that point, had featured more than 150 of the world’s best volleyball athletes; among them Olympic Gold medalists Misty May-Treanor, Kerri Walsh, Phil Dalhausser, and Todd Rogers.